Dry eye is a common condition that occurs when the eyes are insufficiently moisturized, leading to itching, redness and pain from dry spots on the surface of the eye. The eyes may become dry and irritated because the tear ducts don’t produce enough tears, or because the tears themselves have a chemical imbalance. Patients with this condition often experience irritating symptoms and can suffer from more serious vision damage if this condition is left untreated. It is important for patients with this condition to take special care of their eyes in order to alleviate symptoms and prevent complications. Our doctors can diagnose dry eye after a thorough evaluation of your eye and tear production through a Schirmer tear test. These factors can affect the frequency or consistency of tears, both of which can lead to dry eyes. Our natural tears require a certain chemical balance in order to efficiently moisturize the eyes. Dry eye is not only painful; it can also damage the eye’s tissues and impair vision. Fortunately, many treatment options are available to help relieve symptoms and restore health back to the eyes to ensure clear vision and long-term health. Treatment for dry eye depends on the cause and severity of the condition, as well as the patient’s overall health and personal preference. Non-surgical treatments are often effective, and may include blinking exercises, increasing humidity at home or work, and use of artificial tears or moisturizing ointment. 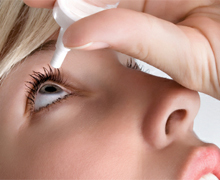 Prescription eye drops are also available to increase tear production. If these methods fail, small punctal plugs may be inserted in the corners of the eyes to limit tear drainage, or the drainage tubes in the eyes may be surgically closed. Eyelid surgery is also a solution if an eyelid condition is causing your dry eyes. Treating the underlying cause of dry eyes can also help relieve the symptoms of this condition. There are certain steps patients can take to prevent the symptoms of dry eye from occurring, which are especially useful for those at an increased risk for developing these symptoms. Simple life modifications such as keeping a humidifier at home or at work, wearing glasses on windy days, giving your eyes a break during reading or other strenuous tasks and avoiding smoking can all effectively reduce the frequency and severity of symptoms. To learn more about Dry Eye or to make an appointment with us, please call 770-419-1393.